THE BRONX — The Legionnaires’ disease outbreak is officially over and health officials identified the Opera House Hotel cooling tower as the initial source of the epidemic, they said Thursday. The outbreak, the worst for the disease in city history, killed 12 people and sickened more than 120, according to health officials. After rigorous testing & verification, we now know that 20+ Legionella samples matched the strain found at the Opera House Hotel. “After extensive review and coordination of laboratory data at the city, state and federal levels, we have identified the source of the outbreak in the South Bronx — the Opera House Hotel’s cooling tower,” city Health Commissioner Mary Bassett said. “We eliminated the danger posed by the Opera House Hotel’s cooling tower as soon as it tested positive for disease-causing legionella." Inadequate maintenance and inadequate levels of biocide in the cooling tower may have contributed to the hotel being the source, according to the Health Department. The Opera House Hotel management said the news was "disappointing" but applauded city and state health officials for keeping staff informed over the past 10 days, a marked difference in tone from their earlier criticism of the way the city handled the outbreak. "It’s particularly disappointing because our system is two years old, has the most up-to-date technology available and our maintenance plan has been consistent with the regulations that both the city and the state are putting in place," according to a statement. "We have worked closely with both the city and the state since this issue first arose and have done everything requested to address the situation." Going forward, the hotel plans to test its cooling tower every 30 days when it is in use. 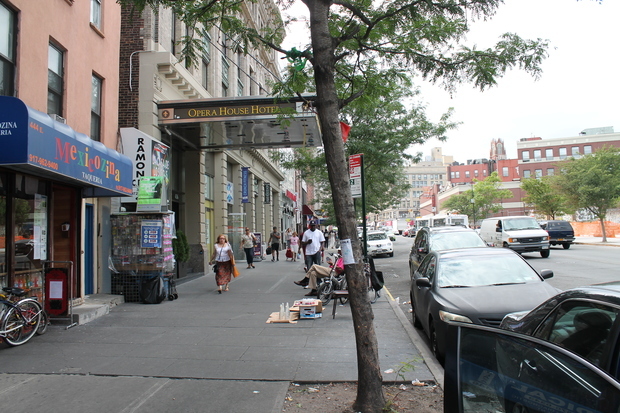 The Opera House Hotel, located at 436 East 149th Street, was one of five initial sites that the city had identified as being infected with legionella, along with Lincoln Hospital, Streamline Plastic Co., the Concourse Plaza complex and a Verizon office building. The outbreak officially began on July 10, although James Rouse, a music teacher who worked in the South Bronx, passed away from the disease back in April, leading family members to criticize the city for not doing more to investigate his death. The last reported case of someone becoming sick from the disease was Aug. 3, officials said. Mayor Bill de Blasio signed legislation into law on Aug. 18 requiring buildings to register cooling towers and clean them quarterly.